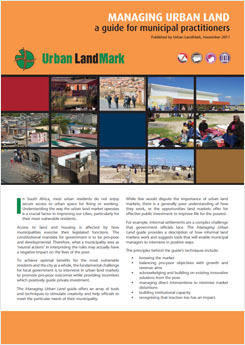 Urban LandMark recently developed a guide for local government in South Africa to assist municipal officials involved in urban land governance to carry out their functions in ways that ensure pro-poor outcomes in the urban land market. Together with Urban LandMark, the Isandla Institute disseminated the guide to a wide range of groupings which include national and provincial government departments and urban and secondary metros, development institutions and academic institutions, donor agencies, professional bodies and sector representative organisations, and advisory groups. The Guide was also workshopped with four key municipalities in urban areas, while both a national launch of the guide and a national workshop with partner organisations were held. The four municipal workshops - held with eThekwini Municipality, the City of Johannesburg, the City of Cape Town and Nelson Mandela Bay Municipality - were a critical component in the dissemination of the guide. These workshops both affirmed the value of the guide for its primary target audience and brought out a number of valuable recommendations regarding the dissemination and take-up of the guide, including potential areas for further engagement or additional research. The design of each of the workshop sessions tried to strike a balance between conveying information and stimulating discussion amongst officials (and other participants) about the applicability and efficacy of the guide's content to the management of their city. Participation in the workshops and feedback from evaluations completed by participants indicated that this balance was in general successfully achieved in each of the city workshops. A range of cross-cutting themes emerged in each of the workshop. the guide and workshops created for cross-departmental and cross-disciplinary dialogue. Municipal practitioners participating in the workshops viewed this as of the primary strengths of the guide. All four municipalities indicated an interest in having the opportunity to engage with the detail of the financial instrument developed by Urban LandMark and its partners to determine land release, as well as gaining a more detailed understanding of the potential and practical considerations of value capture instruments, which Urban LandMark recently analysed in a booklet called Improving access to the city through value capture. A number of participants indicated that the inclusion of sustainability considerations would substantially strengthen the guide and further illuminate the tensions and trade-offs that often characterise planning and urban development. Participants also indicated an interest in those aspects of the guide that provide systematic guidance about how to approach the nuance of informality and its implications for formal planning and administrative processes. A recurring theme was the importance of these messages being conveyed to politicians, particularly councillors. There was the suggestion that the guide could be used as a basis for benchmarking practice across different municipalities in South Africa. It could then be used to stimulate discussion and track progress as municipalities engage with particular issues. Mark Napier, Urban LandMark's programme director, and Stephen Berrisford, who leads the organisation's work on land governance, say the guide starts to show ways of tackling the challenges of urban land management one practical step at a time. to officials, encouraging cooperation with colleagues in other disciplines and departments." Through the work that Urban LandMark and others are doing, municipalities are being supported to be more effective using the tools already available to them, without the need for any radical or drastic law reform.